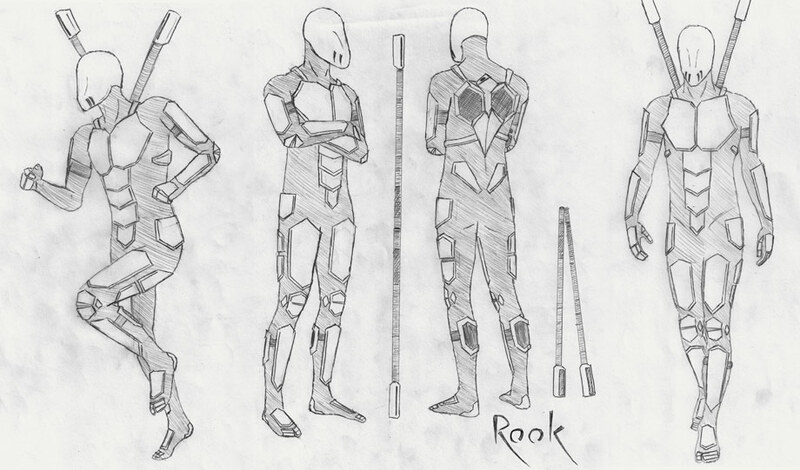 Rook is (in my head) the epitome of justified self-confidence. Biologically retooled to be impossibly fit, thoroughly versed in digital combat, and wearing a spacesuit that would make most engineers cry themselves to sleep, he/she has not just Taken a Level in Badass. Rook Mained in Badass. So yeah, Rook. Silent protagonist for a game I'm working on of the same name, inspired very heavily by Metroid Prime. Should be pretty good if I ever get a solid programmer on my team. Made with pencil, 3 sheets of blank paper, Epson scanner, and composited in Adobe Photoshop CS3.